The non-binding resolution has now passed its initial stage successfully and awaits the Senate to enact it into Law. Now the ball is on the new Prime Minister’s court. 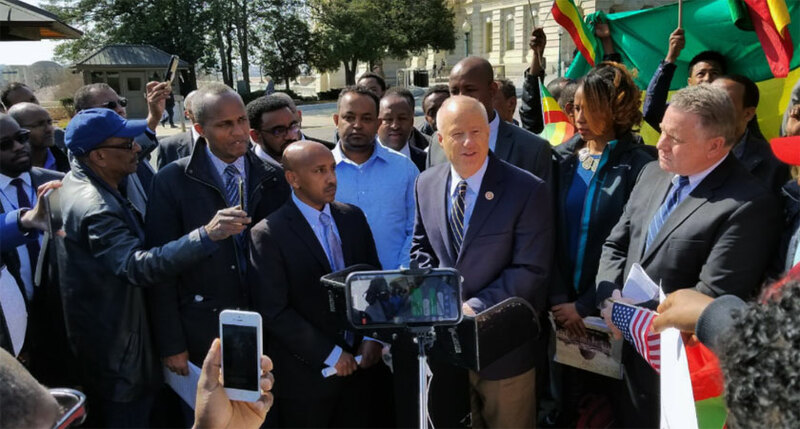 Resolution 128 was passed in large part because of Ethiopian-American voters concerned with the Ethiopian government’s rights record, who worked together to make themselves an important constituency. Their persistent efforts despite the efforts of the Ethiopian embassy and their Washington lobbyists led to an impressive 108 Congressional representatives from 32 states co-sponsoring this resolution. Hopefully, they can build on this success and advocate for binding legislation on Ethiopia. Ethiopia has repeatedly rebuffed efforts to investigate allegations of serious crimes by government forces and has not let in any UN Special Rapporteur to investigate allegations of abuse since 2007. With a new prime minister, now is the time for Ethiopia to change course and allow independent experts to investigate, including the Special Rapporteurs on torture and freedom of assembly. Encouraging those reforms with measurable, specific, and transparent benchmarks in exchange for future cooperation is critical. It is also important that other countries follow the US Congress’ lead on tying support to tangible progress.